Whether it’s for an intolerance or simply to try out the latest diet fad, going gluten-free has become quite the money maker for brands this year. The Los Angeles Times reported this morning that the gluten-free industry looks to hit a value of $4.2 billion in 2019. The report from Packaged Stats stated that the booming gluten-free industry has grown at a compound annual rate of 28% since 2019 and that it looks to be valued at $6.6 billion by 2019. This growth in the popular diet choice translates to two out of every 10 adults in America going gluten free. That’s a lot of people shopping for those unique items in the grocery store. Even a few years ago these brands were obscure and hard to find on most shelves. Today, the options are plentiful. Now the only issue comes with finding the ones that taste the best and won’t break the bank. Gluten-free foods, typically breads, crackers, and baking mixes, tend to be drier than their wheat flour counterparts and are usually more expensive. Thankfully, the boom has changed that. Many products are exceptional in taste and many are comparable in value as well. Here are 7 of the best gluten-free brands that you should be able to find in most grocery stores. One of the biggest challenges in going gluten-free is giving up bread. Even a few years ago, the typical gluten-free bread option was not very appetizing. Thanks to Udi’s there’s an option for those who just want a normal sandwich or toast. They sell some of the best bread in the GF market, in addition to great pizza crusts, buns, muffins, and even cookies. This brand has sat on many shelves for many years. However, the GF products weren’t always sharing the space until recently. Bob’s sells fantastic GF flours and mixes. From pancake mixes to pizza crusts, they have a quality standard that has kept them on the top seller list. Bob’s also sells one of the only GF quick oatmeals in the mainstream market. Tinkyada GF pastas are a notch above all the others. Many GF pastas get sticky and flimsy. They tends to fall apart and are too easily over cooked. Tinkyada carries many varieties of pasta and they all are very high quality. When used in cooking traditional pasta dishes they allow for no tweaks in the recipe or preparation. 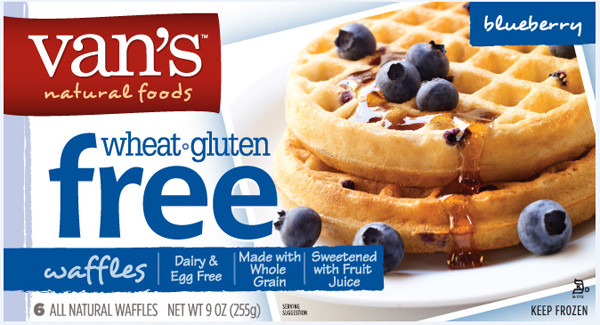 Who knew frozen waffles were any good even without the gluten? Well, Van’s raises the bar. Their frozen waffles are simply delicious. A bonus? They’re more nutritious than most waffles with wholesome, natural ingredients with several gluten-free options to make breakfast more manageable. This brand sells several flavors of GF crackers. They all are very tasty and much better than a simple cracker. They all contain a nut flour that adds a unique flavor. Even for those who don’t avoid gluten, these are better than any cracker you’ll find on the regular aisles. These bars rival any traditional granola bar. They are completely natural, contain no grains, and are one of the best tasting foods on the market. All bars are comprised of minimal ingredients, mostly a grounded up nut and a dried fruit (like our Pumpkin Spice Protein Balls). You’ll never want for a granola bar again. Amy’s vegan frozen food brand isn’t a 100% gluten-free company. However, they do sell many gluten-free options. These choices include rice bowls, shepherd’s pie, and even burritos. The brand alone surprises consumers with how good a frozen food is, and then they go above and beyond with how great their gluten-free choices are. Amy’s has one of the few gluten-free options for people in a hurry who still care about what they’re eating. The Great Gluten Debate: Should You Give it Up?